Research: What's on my knitting needles! February 10, 2011 Adri H.
People sometimes ask how I research a pattern: how do I know how to make something I've never made. Well, the short answer would be: I make it. Or at least, I try to make this thing that I see in my head. But, before I jump into making something abstract, I definitely do research. I look for all kinds of knitwear (or crochet-wear) exhibiting the features I'm interested in, I find other patterns that have an element or feature that applies to what I want to do, and then, when I have time, I make these items or parts of them in order to learn the way they work. 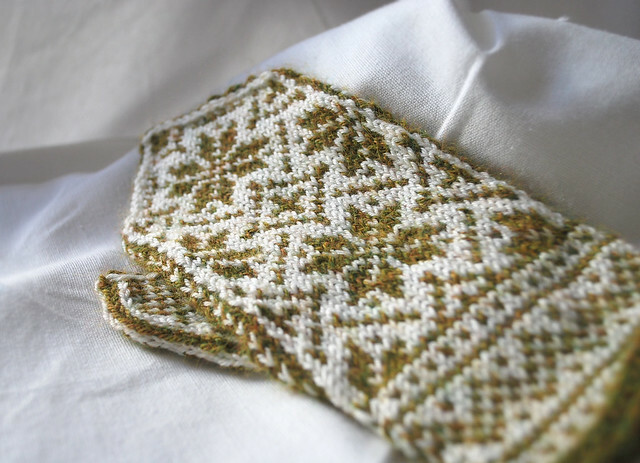 Currently, I have this idea for a pair of colorwork mittens, but I want to be sure that this idea will work out. My goals with the project are twofold: first is thickness - I want a pair of knitted gloves or mittens that insulate and secondly, I want to use this wonderful colorwork chart I've created! So, thinking of solutions for warmth, I contemplated double-knitting the mittens, but after doing a gauge swatch, I realized that double knitting is really more suitable for larger blocks of colorwork and my focus in color was really a lot of seeding (1 st in color A, next st in color B)... This technique won't work with my chart, but maybe it will be the perfect solution for another project. So, I re-read my Alice Starmore's Book of Fairisle Knitting and did a sample swatch, and then I found a really great reference in Northman Mittens by David Schulz. His pattern includes something I haven't seen so often - instructions for a lining! 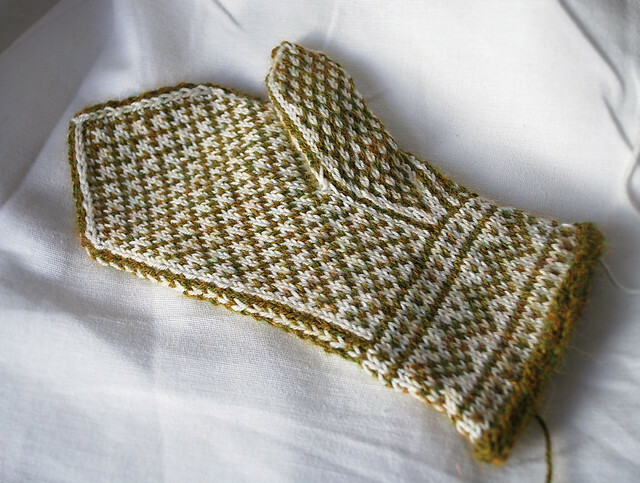 The mittens also include a really simple thumb gusset, and this was one area where my expertise was lacking so I wanted to be sure I could replicate in my own design a clear explanation of what to do when you get to the thumb.